Abstract: The creation of greater New York City in 1898 promised a solution to the problem of supplying Brooklyn and Queens with water. 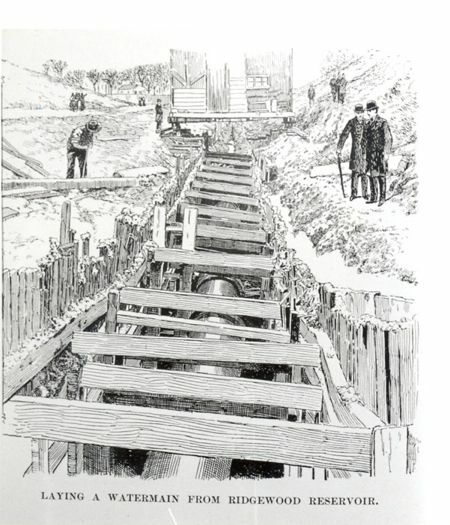 In the 1850s, the City of Brooklyn tapped ponds and streams on the south side of Queens County, and in the 1880s, dug wells for additional supply. This lowered the water table and caused problems for farmers and oystermen, many of whom sued the city for damages. Ultimately, salt water seeped into some wells from over-pumping. By 1896, Brooklyn’s system had reached its limit. Prevented by the state legislature from tapping the aquifer beneath Suffolk’s Pine Barrens, the only solution was to connect to New York’s supply from upstate, which was accomplished in 1917. The ponds and surrounding lands then became part of Robert Moses’s state parks system. In the 1950s, after the Delaware Aqueduct was completed, New York City shut down its Long Island pumps and wells. 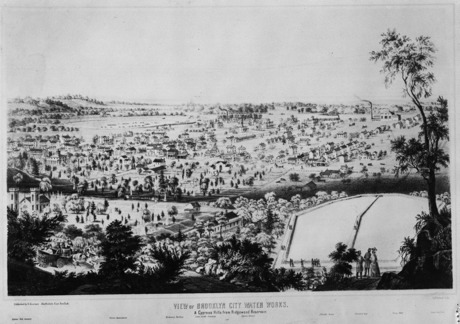 Figure 1: View of the Brooklyn City Water Works (Ridgewood Reservoir), copy of lithograph print by G. Kraetzer, 1859. Courtesy of the Queens Borough Public Library, Long Island Division, Eugene L. Armbruster Collection. The formation of Greater New York in 1898 cemented the city’s position as the nation’s premier metropolis and promised to address, if not actually solve, endemic urban problems. In the years leading up to the event, debate over the proposed merger of Brooklyn, western Queens, Staten Island, and the Bronx (then part of Westchester) with Manhattan was concentrated on political corruption and the influence of Tammany Hall; conditions in the overcrowded, dangerous, and disease-ridden immigrant slums; the necessity of bringing all existing and potential port facilities under a single municipal authority; and an intangible – Brooklyn’s looming loss of independence and identity. One issue largely absent from the discussion was the water question. New York City had completed the Croton system in 1842, and the beneficial effects for both commerce and residents were immediate. Brooklyn had reached eastward to the ponds and streams in southern Queens for its supply in the 1850s. Would those sources be adequate to supply the cities a hundred years hence, or even fifty years? Already by the 1890s, Brooklyn’s system was rapidly approaching capacity, and while the Croton system provided an ample supply for the City of New York, that source was clearly inadequate to quench the thirst of the five boroughs. Still, the question was scarcely broached by either opponents or proponents of consolidation, but how it would be answered would impact not only the growing population of the two cities, but also Long Island’s farmers, baymen, and suburbanites. The momentous act of consolidation completed a process begun in 1874, when New York, originally coterminous with the island of Manhattan, annexed the portion of southern Westchester lying west of the Bronx River (in 1851, New York’s Common Council had rejected a proposal tounite with Brooklyn and Williamsburg). Across the East River, Brooklyn, too, pursued its own imperial destiny. The town was incorporated as a city in 1834 (over some objections from Manhattan), and in 1854 annexed the adjacent City of Williamsburg and the rural Town of Bushwick (known after as the Eastern District). Brooklyn annexed the other towns in Kings County – New Lots, 1886; Flatbush, Gravesend, and New Utrecht, 1894; and Flatlands, 1896 – until the city was coterminous with the county. Advocating for union, Edward A. Bradford of the Consolidation League of Brooklyn argued that the “cost of obliterating the water obstacle is trivial compared with the magnitude of the issues involved.” Obviously, Long Island had no political or economic rights that should impede the city. The population and land of Long Island, he claimed, “are New York’s in fact, and may be so in name, if the voters so decide. Across the East River lie idle acres lacking only men and houses to create values and taxable resources now scarcely dreamed of. This is Long Island’s dowry in the union which shall produce Great York. New York can only reject the proposal at the cost of sinking to a second rate city.” Brooklyn, of course, had long considered Long Island as her natural hinterland, the source of water and agricultural produce, and had built the first railroad from the East River to Jamaica in 1836. The fate of Queens County was one of the thornier issues involved in the creation of the greater city, for unlike Kings and Richmond, borough and county were not identical. In truth, Queens had never been much more than a geographic expression, the sparsely populated townships and industrial Long Island City joined in a loosely structured, and thoroughly ineffective, county government. The Board of Supervisors did not even have a permanent home, but met at taverns across the county. Just weeks after the birth of Greater New York, which took in Long Island City, Newtown, Flushing, and Jamaica, citizens of Hempstead, North Hempstead, and Oyster Bay initiated a campaign to erect “a new county out of that portion of the County of Queens which lies without the Borough of Queens.” The issue moved forward with remarkable speed. The Nassau bill was introduced in the legislature in February, passed in March, and was signed by Governor Frank Black in April. On January 1, 1899, exactly a year after the creation of Greater New York split Queens County in two, Nassau County was born. In 1856, Brooklyn issued municipal bonds to fund the purchase of $1.3 million in stock of the new Nassau Water Company (incorporated April 25, 1855), and construction commenced at once on the reservoir and conduit. The aqueduct was built from Cornell’s Pond in Valley Stream to Baisley’s Pond in Jamaica, and from there to a reservoir atop the hills at the border of Kings and Queens. The ponds were drained to remove hundreds of thousands of cubic yards of mud and rotting vegetation that had settled on the sandy bottom. Initially, water from these two ponds and the streams feeding them was thought to be a sufficient supply, but very soon the works were extended eastward to Hempstead Pond, with a surface area of 23.5 acres and a capacity of 5.4 million gallons, providing an estimated flow of 7.8 million gallons per day (mgd). Situated opposite the Cemetery of the Evergreens, the Ridgewood Reservoir was built in a natural basin 172 feet above sea level, overlooking Cypress Hills and East New York. Brooklyn Mayor George Hall thrust the first shovel into the ground at the ground breaking on July 1, 1856. Reverend Kennedy told the assembled crowd, “This day our Mayor, like Moses in the wilderness, strikes the desert spot, and the gladdened stream is to come forth and bless the people.” The two basins covered 25.5 acres, and with a depth of 20 feet had a capacity of 161 million gallons. The Ridgewood Reservoir began filling on November 18, 1858, and in December water was flowing into the city’s newly installed water mains. In January the fire hydrants were functioning and homeowners who had tapped into the system enjoyed fresh water in their homes. On April 28, 1859, the justifiably proud city staged a massive celebration: a five-mile long parade with thousands of participants, including elected officials, fire companies, military regiments, and tradesmen; speeches by Peter Cooper, Governor Edwin D. Morgan, and officials from Philadelphia, Boston, Buffalo, Richmond, Baltimore, and Hartford; a triumphal arch; and fireworks. An ornamental fountain in front of City Hall demonstrated the accomplishment in grand fashion. Figure 2: Laying a Watermain from Ridgewood Reservoir. Reproduced from A History of the City of Brooklyn, 1867. As Brooklyn grew, so did its need for water. Reporting to the Board of Water and Sewerage Commissioners in June 1870, Chief Engineer Julius W. Adams wrote that it was crucial that construction begin soon on a new storage reservoir in Hempstead Valley because “the increasing population of this city has already consumed for a period during the last season our minimum daily water supply …. With the best information to be had in reference to the population, the possible average daily consumption of water in this city in 1875, may reach 30 million gallons, or 10 million gallons in excess of the present supply.” Between 1862 and 1871, average daily consumption increased from about 5 million gallons to 19 million, the capacity of the original works. Civil Engineer Augustus Kurth concluded that “we can point out with certainty the time, near at hand, when our conduit, which has been constructed with a capacity to deliver 40,000,000 gallons in 24 hours, will not be sufficient to supply the needed want of water.” In 1882, demand had reached nearly 35 million gallons a day. Without question, the water system facilitated Brooklyn’s growth. From 266,661 in 1860, the city grew to 806,343 in 1890, a three-fold increase. Water may not have caused all this growth, but it would have been impossible without it. Industry, too, consumed enormous quantities. The sugar refineries and breweries used hundreds of thousands of gallons a day. By the 1880s, Brooklyn was the fourth largest manufacturing center in the nation. The age of steam was also the age of water (as is the age of air conditioning). With the ponds and streams fully exploited, Brooklyn had to find additional sources for its increasing population. Wary of those intentions, as early as 1884 the Supervisors of Suffolk County resolved to oppose “the enactment of any measure, which, under the plea of supplying water to the City of Brooklyn, may presently or prospectively take from any part of Suffolk County water needed for the use of its own population.”Rather than extend the aqueduct eastward, Brooklyn opted for a more cost effective solution. The city purchased land in southern Queens and sank 150 foot wells to tap the water in the gravel below a 50 foot layer of clay; one such well yielded more than 5 mgd. By the end of the century, Brooklyn’s water system had been extended to Massapequa, and the city was casting a covetous eye on the Pine Barrens in Suffolk County. 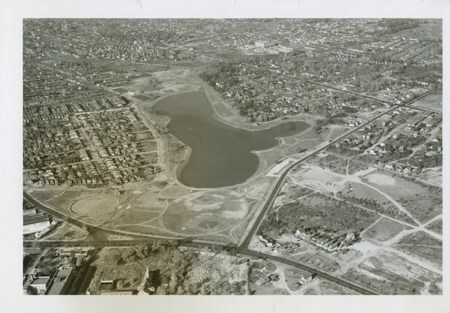 Figure 3: Aerial View of Baisley Pond, looking north-northwest, November 2, 1940. Courtesy of the Queens Borough Public Library, Long Island Division, Illustrations Collection. But pumping was not the only cause of the lower water table. A century of agricultural expansion and commercial activities also had its effect. “While nature has thus provided underground streams in abundance,” wrote one observer, “it is only ordinary care on the part of the people to preserve conditions which contribute to the continuance of those brooks and ponds which play such an important part in surface irrigation. There is no more fruitful cause of their wasting away and final disappearance than the destruction of the woodlands in their vicinity.” Throughout the 19th century, the island’s forests had been harvested to supply the city with firewood. It was one of the most profitable industries on the island, but there was no effort to maintain the woodlands as a sustainable resource. Denuding the landscape for profit almost certainly increased the rate of surface run-off and thereby compromised the aquifer. Long Islanders had little recourse against Brooklyn, and later the City of New York, even though the negative impact upon agriculture and aquaculture was obvious. The case of Frederick Reisert demonstrates the difficulty farmers had in asserting their rights. Reisert had an 82-acre farm at Foster’s Meadows, along the line between the towns of Jamaica and Hempstead (roughly where the Laurelton Parkway was built). In May, 1885, Brooklyn began pumping from new wells immediately north of Reisert’s property near the source of Clear Stream, a “fine natural running surface stream” that ran up to three feet in depth and supported a trout farm. After pumping commenced, the stream “practically dried up, and such water as is found in its bed now is surface water, and although immediately following rains water flows through the creek, the flow soon stops, and what water remains is stagnant. Prior to the trespass the stream was permanent, did not dry up in summer, and seldom froze over in the winter time.” The soil was rendered “dry and worthless for cultivation” and a profitable market gardening business damaged. Regardless, the court ruled that the only real damage Reisert suffered was that he had to dig a deeper well, and awarded him a nominal $90 in damages. Reisert appealed, and in March 1903, Judge Bartlett ruled that the city “has seen fit to occupy the position of a naked trespasser, and sought to justify its action on the ground of paramount necessity arising from the requirements of a great city for an adequate supply of pure and wholesome water. If it is necessary in the public interest for the defendant to subject the inhabitants of Long Island to the damages incident to maintaining a large number of pumping stations and driven wells, depriving extensive sections of the country of its underlying and percolating waters, as well as drying up its surface streams and wells, the least it can do is to meet plaintiffs in a spirit of fairness, eschewing technicality, and ascertain their actual damages in the premises, and if not contented to pursue such a course to institute condemnation proceedings. It is true that the rights of the individual must yield to public necessity, but it should always be kept in mind that this result can only be fairly and legally accomplished by duly compensating the citizen for property damaged or destroyed.” Still the city did not settle. In 1905, the Appellate Division again ruled for Reisert, noting that he most certainly had suffered damages beyond the cost of drilling a deeper well. Reisert’s victory was not the final word, however. Corporation Counsel Francis K. Pendleton refused to settle any of the cases still pending, totaling $2 million, and ordered a thorough investigation. The resulting engineering data appeared to confirm the city’s argument that pumping had no impact on the surface water upon which they contended the farmers depended. In March 1909, the State Supreme Court decided in favor of the City of New York in actions for damages brought by property owners in Queens and Nassau; based on evidence submitted by the city’s engineers, Judge Dickey called the farmers’ claims “fanciful.” This decision meant the city would no longer be liable for the environmental impact of its wells and pumps. Brooklyn did not need the protests of Long Islanders against the adverse environmental impact of its system to see that it would soon require additional supply. Engineers determined that millions of gallons were wasted each day because of contamination and pollution. Clearly, it would be impossible to secure all the property adjoining the wells and ponds, nor could the city control use. The flow from Springfield Creek into Baisley’s Pond was foul and unfit for consumption, the product of “stables, outhouses, pigstys and chicken coops, some of them within 50 feet of the stream.” The inevitable growth of Queens promised that such conditions would only worsen. In January 1896, Commissioner of City Works Alfred Treadway White issued a report on the prospects for future supply for a system nearing capacity. The water system had a daily capacity of 94 million gallons; by 1899, daily use by the almost 1.2 million residents had reached 92 million gallons. With its population steadily growing and no additional supply on the horizon, Brooklyn would have faced a severe crisis. When the original system reached its limit of 19 mgd, Brooklyn could acquire additional ponds further east and dig wells. Such an option was no longer there by 1900. Looking ahead half a century, the magnitude of the issue is clear. By 1961, the 4.5 million inhabitants of Brooklyn and Queens, together with local industries, particularly the breweries, consumed 640 mgd. This report produced an immediate reaction in Suffolk, and just a month later their representatives in Albany introduced legislation to protect their county from Brooklyn’s designs. In June 1896, Governor Levi P. Morton, a Republican, signed a law sponsored by Assemblyman Carll S. Burr of Commack that prevented Brooklyn from drawing off Suffolk’s water without the approval of a majority of the county supervisors. As such an outcome was unlikely (barring the wholesale bribery of the decision-makers), that measure effectively gave the 77,000 inhabitants of Suffolk the power to deny the aquifer to the 1.2 million people in Brooklyn. When the governor signed the Suffolk water bill, Brooklyn, its imperial designs thwarted, for the first time confronted a constrained future. Still, despite the looming crisis, the water question scarcely entered into the debate over consolidation, dominated as it was by issues of taxation, corruption, home rule, and party politics. From this perspective, consolidation actually ensured Brooklyn’s continued growth, for the city had reached the limit of its existing sources and the best option for expanding the supply – the Pine Barrens – had been closed to it. To address this predicament, the city built a new system of reservoirs and aqueducts to deliver water from the Catskills. Construction began in 1907 and, remarkably, water from the new Ashokan Reservoir was flowing into the five boroughs only ten years later. Newtown, Jamaica, and the Rockaways continued to depend on well water. The Jamaica Water Supply Company served half a million customers in southeast Queens into the 1990s, and in 1996, after years of complaints about poor water quality and high bills, the city took over the company and began shutting it down. During a water shortage in 2002 the city reopened 11 of the wells and began pumping 10 mgd, but a fluctuating water table was no longer the only concern. Tests revealed unsafe levels of perchloroethylene – perc, a chemical used in dry cleaning – in the water, the legacy of a spill at a chemical distribution company in the 1970s. Brooklyn’s old water system was transferred to the City of New York with the rest of its municipal property in 1898. Connection to New York’s system was not immediate, however, and the city had to maintain and upgrade the works. In 1909, the city prevailed over objections by Nassau County and the State Water Commission to install a new 72-inch main along Sunrise Highway. Even after connection to New York’s system, many Brooklynites continued to receive their water from Long Island because the Catskill and Croton systems were near capacity; dependence on Long Island’s water persisted until the Delaware reservoir system came on line in the 1950s. Still, connection to the city’s reservoirs meant that some of the Long Island facilities were no longer essential. In the 1920s, several of the ponds and surrounding acreage came under the control of Robert Moses’s Long Island State Parks Commission and were transformed into his system of parks and parkways. The property in Valley Stream, Hempstead, and Massapequa thus remained public, and as they once provided water for an urban populace, they now became playgrounds. The abandoned Ridgewood Reservoir gradually became overgrown and eventually became a thriving wetland (the New York City Department of Parks has advanced a proposal to turn the basins into playing fields covered with artificial turf; preservationists, environmentalists, and nearby residents have advocated the restoration of the historic site as a nature preserve). 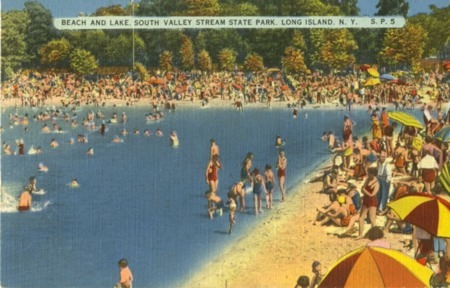 Figure 4: Beach and Lake, South Valley Stream State Park, circa 1940. Courtesy of the Queens Borough Public Library, Long Island Division, Post Card Collection. Almost as soon as Brooklyn, Queens and Staten Island began drawing from the Croton and Catskill reservoirs in 1917, the Board of Water Supply understood that those sources would not be sufficient to serve the city’s increasing needs. In 1921, the Board turned its gaze beyond the Catskills to the Delaware River watershed. This possibility drew opposition from New Jersey and Pennsylvania, for both depended upon the river for drinking water. Also, the river and its estuary supported a thriving fishing industry. In May 1929, New Jersey filed a bill of complaint to prevent New York State and New York City from tapping the watershed of the Delaware River above Port Jervis. In January 1930, the United States Supreme Court appointed Charles N. Burch of Memphis, Tennessee, special master to decide the question, and a year later, he issued his report supporting New York City’s need to increase its water supply and its right to do so. “The New York tributaries of the Delaware furnish the best and purest source of additional water… the most satisfactory and economical supply,” he wrote. “New York City, acting under the authority of New York State, should have the right to select its source of additional water supply. This is a matter which concerns the administration of its own internal affairs and should not be controlled by another state unless its plan … is willful or arbitrary and without sound basis and unreasonably injured such other state.” He did, however, limit the state to taking 440 mgd (later increased to 800 mgd). The United States Supreme Court affirmed the decision. At this point the city realized that further requests to tap the island’s water table would be futile, and moved to accept the Commission’s suggestion that the Delaware River supply be tapped. In June 1936, the Board of Estimate voted $20 million to start work on the Delaware system, and construction began the next year. Construction slowed during World War II, but finally in 1951 the Rondout Reservoir in Ulster and Sullivan Counties was in operation. The Neversink (1953), Pepacton (1955) and Cannonsville (1964) reservoirs completed the system. New York’s aggressive approach assured its citizens of ample pure water into the 21st century. As more neighborhoods in Brooklyn and Queens were finally connected to New York’s system, pumping decreased at the city’s facilities on Long Island. Finally, on February 14, 1958, the city began “to shut down its 22 mile system of wells along the South Shore of Nassau which have been supplying water to consumers in the Rockaways and East New York” (the wells yielded 70 mgd). The following year the city began to dispose of the old watershed, selling or donating 858 acres to local towns, while retaining 1,500 acres east of Freeport until the new lines from the Delaware system were constructed in Brooklyn and Queens. The resulting report, released in March 1937, confirmed the threat of salination. Wells in Brooklyn were heavily overdrawing the supply under that borough, and Queens was drawing close to its limit. Although Long Island had ample underground reserves, the uneven pumping caused the wells in western portions to decline while significant supplies lay untapped beneath central Suffolk. Consolidation in 1898 thus proved an ultimate benefit to Long Island. Almost certainly, had Brooklyn succeeded in gaining control of the aquifer beneath the Pine Barrens, conflicts over water use and development would have retarded Long Island’s growth and had an adverse effect on the island’s environment. As it was, however, development pressures compromised the integrity of the Pine Barrens. The aquifer, so jealously defended by Suffolk in the 1890s, was unprotected for a century as the agricultural landscape gradually yielded to suburban pressures. Between 1950 and 1990 the county grew from just over a quarter million residents to 1.3 million; in the 1960s alone the population grew by nearly half a million. This meant, of course, a new threat to the groundwater. Across Nassau and Suffolk there were 450,000 cesspools daily discharging 150 million gallons of raw sewage, and about 10,000 more cesspools were built each year (an argument Governor Nelson Rockefeller advanced for passage of the Pure Waters Bond Act in 1965; the voters indeed approved the measure). Only in 1993 did the state legislature pass the Pine Barrens Protection Act to conserve this valuable and irreplaceable resource, and even this came only after compromises opened other parcels to new development. In pursuit of economic growth – real estate development yields higher tax revenues – Suffolk approached the limit of its precious water supply, just as Brooklyn had a century before. But while Brooklyn could look to additional water from New York’s system, Suffolk has no option other than reforming its own practices and policies. For a history of annexation, see Kenneth T. Jackson, Crabgrass Frontier (New York, 1985), ch. 8; David C. Hammack, Power and Society: Greater New York at the Turn of the Century (New York: Russell Sage Foundation, 1982), p.185; for a discussion of harbor development, see Jeffrey Kroessler, “The Greatest Port that Never Was,” Seaport, XXVIII, no. 3 (1994). New York Times, 1 January 1852. Henry Isham Hazelton, The Boroughs of Brooklyn and Queens, Counties of Nassau and Suffolk, Long Island, New York, 1609-1924 (New York: Lewis Historical Publishing Co., 1925), Vol. III, 1534; Margaret Latimer, “Brooklyn,” Encyclopedia of New York City (New Haven: Yale University Press, 1995), p. 149-151. Edward A. Bradford, “’Great York’: An inquiry into the relation of rapid transit and consolidation to past and present poverty, disease, crime, and mortality and their remedy” (Brooklyn: Consolidation League of Brooklyn, 24 September 1894). Reprinted in the Flushing Journal, 18 April 1891. Queens County Review, Jan. 28, Feb. 11, 1898; Paul Bailey, Long Island: A History of Two Great Counties, Nassau and Suffolk (New York: Lewis Historical Publishing Co., 1949), Vol. II, 216-217; State of New York, Chapter 588, Laws of 1898; Queens County Review, 15 April 1898; Jeffrey Kroessler, “The Greater City and Queens County,” Long Island Historical Journal, 11, no. 1 (1998). New York Times, 8 January 1852. George B. Brainard, The Water Works of Brooklyn: a historical and descriptive account of the construction of the works, and the quantity, quality and cost of the supply (Brooklyn: 1873), p.10-12. New York Times, 19 April 1852; 7 January 1853; 5 March 1853. New York Times, 5 March 1853; 28 April 1853. New York Times, 29 March 1854; 30 May 1854. New York Times, 1 August 1856; Brainard, p.25-26. New York Times, 11 November 1858; 7 December 1858; 15 January 1859. New York Times, 29 April 1859; Brooklyn Eagle, 13 May 1932. Chief Engineer Julius W. Adams to the Board of Water and Sewerage Commissioners, 20 June 1870. Report of Civil Engineer Augustus Kurth, 1 October 1873; Henry R. Stiles, The Civil, Political, Professional and Ecclesiastical History and Commercial and Industrial Record of the County of Kings and the City of Brooklyn, N. Y., from 1683 to 1884 (New York: Munsell & Company, 1884), vol. I, p.590. Brooklyn Eagle, 23 November 1884. Department of City Works, “Report on Future Extensions of Water Supply for the City of Brooklyn” (Brooklyn: the Department, 31 January 1896), p.8; Queens County Review, 28 May 1897; Jacob Judd, “Water for Brooklyn,” New York History, vol. XLVII, no. 4 (1966); Bailey, vol. I, ch. XIII, p.427; vol. II, ch. XXXII, p.274-278. New York Times, 11 November 1858. New York Times, 4 December 1858; Act of the Brooklyn Common Council, 5 May 1870. Queens County Review, 8 November 1895; 15 May 1896; 29 May 1896; 12 February 1897; 17 September 1897; 24 September 1897. N. Hallock, “The Water Supply of Long Island,” The Island Review, vol. VII, no. 7 (1899); for a detailed description of the geological aspects of the aquifer, see R.C. Heath, B.L. Foxworthy, and Philip Cohen, “The Changing Pattern of Ground-Water Development on Long Island, New York” (Washington, D.C.: United States Department of the Interior, Geological Circular 524, 1966). A Long Islander, “Another View of the Water Supply of Long Island,”The Island Review, vol. VII, no. 7 (1899); for the impact of deforestation, see William Cronon, Changes in the Land (New York: Hill and Wang, 1983), ch. 6, 8. Frederick Reisert v. The City of New York, 69 A.D. 302; 74 N.Y.S. 673; 1902 N.Y. App. Div. LEXIS 425; Frederick Reisert, Appellant v. The City of New York, Defendant; 101 A.D. 93; 91 N.Y.S. 780; 1905 N.Y. App. Div. LEXIS 312. Frederick Reisert v. The City of New York, 174 N.Y. 196; 66 N.E. 731; 1903 N.Y. LEXIS 1321; Frederick Reisert v. The City of New York; 101 A.D. 93; 91 N.Y.S. 780; 1905 N.Y. App. Div. LEXIS 312. New York Times, 12 March 1909. Brooklyn Daily Eagle, 17 December 1899. Reprinted in the Queens County Review, 1 May 1896; N.M. Perlmutter and Julian Soren, “Effects of major water-table changes in Kings and Queens Counties, New York City,” (Washington, D.C.: United States Department of the Interior, Geological Survey Research, 1962), E136. Department of City Works, “Report on Future Extension of Water Supply for the City of Brooklyn,” p.8, 23-31. Queens County Review, 13 March 1896; 6 June 1896; Brooklyn Eagle, 17 July 1896. Flushing Journal, 4 June 1892; 18 June 1892; 25 March 1893; John R. Freeman, “Report upon New York’s Water Supply with particular reference to the need of procuring additional sources and their probable cost” (New York: 1900), p.7-17, p.31-32, p.100, Appendix 15 and 16. Eric A. Goldstein and Mark A. Izeman, “Water,” Encyclopedia of New York City, p. 1245. New York Times, 26 October 1936. Queensborough, vol. 6, no. 18 (1920), p. 342. New York Daily News, 27 February 2002; Goldstein and Izeman, p. 1245. New York Daily News, 27 February 2002; Newsday, 3 October 2002. Brooklyn Daily Eagle, 9 August 1909. Robert Caro, The Power Broker: Robert Moses and the Fall of New York (New York: Alfred A. Knopf, 1974), ch. 9-12; Jeffrey A. Kroessler, “Long Island State Parks Commission and Jones Beach,” in Hilary Ballon and Kenneth T. Jackson, Robert Moses and the Modern City: the Transformation of New York (New York: W.W. Norton & Company, 2007), p.158-160; for the controversy over the Ridgewood Reservoir, see http://ridgewoodreservoir.blogspot.com. New Jersey v. New York et al. ; 283 U.S. 336; 51 S. Ct. 478; 75 L. Ed. 1104; 1931 U.S. LEXIS 150; New York Times, 3 February 1931; Goldstein and Izeman, p. 1246. New York Sun, 16 January 1932; New York Times, 17 April 1932. Queens Evening News, 21 May 1934; New York Times, 20 November 1935; Long Island Daily Star, 13 June 1936. Goldstein and Izeman, p. 1246. Long Island Daily Press, 14 February 1958; New York Times, 2 February 1958; New York Times, 4 February 1959. New York Daily News, 2 March 1978; Perlmutter and Soren, E138. Governor Herbert H. Lehman, Message to the Legislature, 20 February 1936. Long Island Daily Press, 3 March 1937. Newsday, 29 October 1965; New York Times, 4 November 1965; Roger Wunderlich, “Suffolk,” The Encyclopedia of New York State(Syracuse: Syracuse University Press, 2005), p.1498-1500.